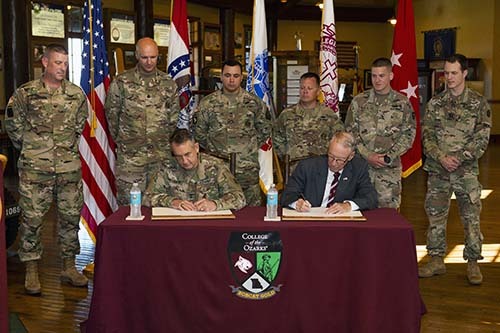 Maj. Gen. Stephen L. Danner, the adjutant general of Missouri, and College of the Ozarks President Jerry C. Davis sign the agreement for the new commissioning program in a brief ceremony today, Sept. 5, 2018, at C of O. POINT LOOKOUT, MO. 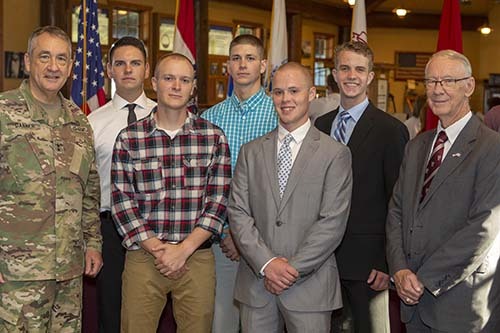 — College of the Ozarks launched a new program to commission graduates as second lieutenants in the Missouri Army National Guard, beginning with the 2018-19 academic year. The leadership of the MOARNG has worked closely with the College to help design the program to best equip cadets, honor the mission and goals of the College, and assist the MOARNG in developing future leaders. Previously, the College was an affiliate of the Army ROTC Bear Battalion at Missouri State University. The College decided to end its affiliation with this program after the Army changed the terms of its longstanding agreement with the College. The College believes the new program will enable it to fulfill its unique mission more effectively. Students will now have the opportunity for commissioning through the program with MOARNG, which will begin in fall 2018. Students currently contracted with the Army ROTC will complete their obligations through the ROTC program at Missouri State University.